While admitting that he did receive a Rs. 1 million cheque from Walt and Row Associates for election campaign in 2015, former Minister SLFP MP Dayasiri Jayasekara today said he was neither an MP nor a member of the COPE, when he received it for election funding. He told Parliament that it was a cash cheque and added that he could not remember whether it had been signed by Perpetual Treasuries Ltd. owner Arjun Aloysius. "It was a cash cheque and was not addressed to me. I can't remember whether it had been signed by Aloysius and who encashed it. Someone must have encashed it and used for my election campaign," he said. 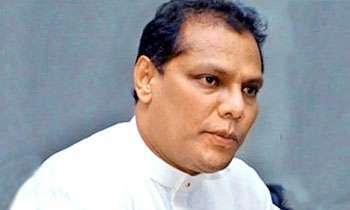 He said it was a normal practice in Sri Lankan politics for businessmen to support election campaign of not only Parliamentarians but also of Provincial Councillors and Pradeshiya Sabha Members. "As I have said earlier I had close business relationship with Arjun Aloysius. When the said cheque, dated July, 13 in 2015 was given to me, I was campaigning for the General Election after functioning as the Chief Minister in the North Western Province," he said. The MP said he never acted to protect Arjun Aloysius in the COPE by obtaining money adding that he would never do so in the future. "There are many persons who had obtained money from Aloysius. If the other 3,000 pages of the Presidential Commission of Inquiry into the bond scam were presented in Parliament, those names would also be revealed," he said. He said the Government had resorted to a witch-hunt of the SLFP MPs who came out of the Government. Aiyo Dayasiri! You do not even know who signed the cheque. This is indication of how many you have got. Your bank account have to be checked. You say your are a good friend of the bank robber. What ethics did you have to sit in COPE proceedings? His memory is suddenly fading ! And we maintain him!!! @billy: The bond scam was exposed very much before the parliamentary elections. And by that time everybody in the country knew that Perpetual Treasuries was involved. Dayasiri is a blatant liar who would give a good competition to RK. Dayasiri is a bluffer but now he is caught by his mouth itself. Dam idiot. He is a liar and a cheater like Mahinda his master. Anyway Dayasiri you are a Hora. Better now he get in to the streets and sing and earn, not to rob and live. My assessment is that over 90% in parliament are tainted with PT money. Now I think I should contest the next general election. I dont remember song is very old song.no use to sing it again.people start to vomit when they hear it. 'I Can't Remember'. This is their weapon now. Dayasiri is No.2 Duminda Silva, as his memory too lost. Usual defence of revenge without answering to the charge of accusation. "Daya-Sorry" - Is this man a qualified lawyer ? How he passed the final Law Exams like this? These are our Law makers as the MPs are called in western democracies. Now he can join JJ.A........ associates. Is Namal is a qualified Lawyer? Like wise, Dayasiri also not a qualified lawyer - just paid money and added qualifications after his name. He is a street singer, that is true. This has happened after the first bond scam. He should have known better. What a shameful act. He has obtained the money well after the bond scam came to light and his colleagues were crying foul. If Mr Dayasiri was genuine, he should not have accepted the money. Again, he is rather vague about the matter, "someone must have encashed it and added to my campaign fund" Point is, did he disclose this to the election commission? Is there a campaign funding disclosure law in Sri Lanka ? Very week excuse but the whole country knows what sort of a person you are and also you gave found refugee at the most suitable place for you. The place is non other than the lap of mara. As you seem to be someone who has just landed from some other planet, must make you know that this whole fiasco of bond robbery was Ranils work. Did Dayasiri declare this money in his income tax return? Is it legal to receive such large some of money for election campaign? If he has violated so many laws can he sit in the Parliament as an MP? "never acted to protect Arjun Aloysius in the COPE" even after obtaining money from him? We can well and truly believe you. The Bond Scam happened in February 2015. It was common knowledge who was involved in it by July 2015. You say that it is the normal practice for businessmen to donate for the election , so what is the return he is expecting for the donation? Ranil hora hora hora. Now every one can see all thieves have been under the presidents nose all along. President is the biggest hora now.his henchmen take bribes in millions. What a lame excuse? He stands naked in the eyes of public. Tax free ? Over to you IRD. Look forward to hearing from you. HE DOSE REMEMBER THE DATE OF THE CHEQUE,BUT DOSE NOT REMEMBER WHO HAD SIGNED THE CHEQUE. SHOULD WE LAUGH ? Mr. Dayasiri, please be a gentleman without giving lame excuses. You are saying that it was given by a businessman for your election campaign. Isn't it?If so, don't you think that you are under obligation to that businessman to support him, whenever he requests for any favors in business activities connected to public funds? Don't you think that you have taken an unwarranted favor from a businessman? To me, I feel that it is a bribe in advance.Better you had resigned from your cabinet portfolio. Under these circumstances, you wanted to be a Saint in supporting the no-confidence motion against Hon. PM. Isn't it? This is the type of our law makers. Sri Lanka is not a country which will develop ever. Our voter too is responsible. What was expected from you for this one million by the one who gave you? Tell us the truth. You voted for the no confidence motion and also ridiculed Ravi so we expected you to be a clean man but you are in the same boat, shame. Doesn't know how these politicians are lying like this. Is it a born habit. Yes people in the country knows about the scam, corruption or fraud had took place in Central Bank and not a single politician or anyone talks about about or published that they have been bribed by culprits who involved. After a such a long period these people are vomiting out that they have been bribed by spending or investing money for future. Cannot trust most percentage of the politicians that they comes power by the votes of innocent people and after forgets. Not only the present, all times Rulers are Cheaters. That's the game in Political Arena and the voters are spectators who suffers. Dayasiri just vanish into thin air without singing "bailas". Like Ravi K mama danne neha Mata mathaka neha ! I think we Sri Lankan need a military government. So we can shoot all these rouges at the Galle face Green in the presence of the public. Dear Daya. you tell us what we should do now. cry or laugh. you guys are wonderful patriotic politicians hah hah ha... please tell me personally the actual figure you received from notorious Alosius. and also, how much the Bet man gave you for keeping him in the job without problem. 3 cheers to SL. Lets bomb them all! You must resign immediately. Bribery is dangerous and no law maker or official should be allowed to be in office if he had accepted such a bribe. He is a person who voted against RW for his (RW) alleged connections to the bond scam. Dayasiri, Don't try to hide any more. All Sri Lankans- for that matter any human being can guess what's the matter behind the scene. Try not fool the humanity. Accept and retire from politics.Best thing to save the face.Oh dear we trusted you too much. Shame on us than on you. If it was a legitimate payment then the cheque would have DJ's name on it, and it would be paid into his bank account.Only reason to write a cheque for cash is to hide the transaction.So why did they want to hide it ????? Even today's montessori kids do not give such an excuse! Kithul gahata negapu minihatath Kiyanna deyak thibunaly. Corrupt politicians hide behind communal issues to hide their criminal acts! Now he got the qualification to join JO. What a shame daya... Don't tel lise to people when all details were revealed by CID .. now no any genuine political party accepted you in the future here after.. which political party does this man accept as a member..
After truth came out this corrupt fool says he got it. How many people got one million each by Perpetual Treasuries PLC to spend for elections?Some have got Millions of US Dollars to spend abroad. Just three little words - not I love you BUT 'what a rotter. Rilasiri cannot compete with RaviK or others robbers of the Disce aut dicsade school. So he "took" only 1 million instead of 1 billion and isn't that an accomplishment? Normally people are paid for some services provided, how and why this money paid? He must be in jail along with Arjuna Aloysius and Palisena. Shame on you, Mr. Dhayasiri.. Are you suffering from DEMENTIA like other corrupt politicians in the ilk of Duminda Silva, Ravi K. etc. ?You are like any other crooked and corrupted politicians. What is your evasive and twisted explanation ? Don't ever think people are fools anymore. Hamban, don't call Dayasiri Mister!! Just call him hora!! Is it Parliamentary Privilege to Take Bribe ???? RK Penthouse - The List may increase - 007 Film has got many record breaking Series. Hope Sean Connery/ Roger Moor will come out take try these guys in the New Court put them in Jail. "CAN'T MAKE A SILK PURSE OUT OF SOWS EAR"
why do businesses fund politicians? because they demand favours at the end of it, and politicians like it because they get backhanders throughout. that is a fact. why did this dullard accept it? don't ask him because he will lie through his teeth like they all do. Without calling these politicians HE they must be refered as HO ( HORU telling BORU ) so that people know their PAST ACTIONS. Well, what is the difference between RK saying he did not know who gave the luxury apartment he was living in and Dayasiri saying he got Rs.1 Million cheque which he cashed and enjoyed BUT he does not know who gave it!!! Now, he wants the AG's office to expose 18 other who got such "santhosam". Is he trying to justify him getting the bribe because others also got it??? These are bloody crooks who shout hoarse at others!!! Dayasiri, what do you tell now?